We’ve been living in our current home for over six years but haven’t had the time or money to do as much to it as we’d like. 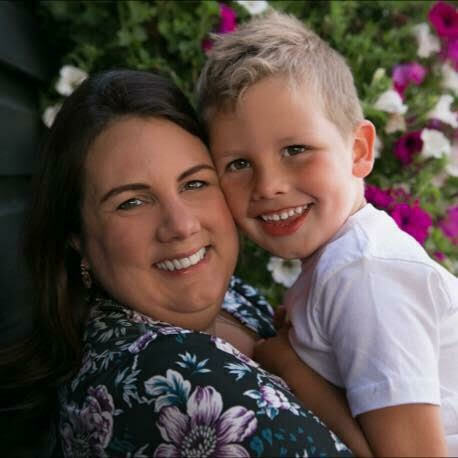 Your home should be your sanctuary – especially when it comes to self-care and especially when you’re a part time stay at home mum and you spend a lot of time at home. That being said, I was thrilled to finally get our new bathroom finished at the end of last year. It is now bright and beautiful, with a traditional twist, and is the perfect place to indulge in all the lovely me time activities I’m always advocating here. My husband and I are really big fans of the traditional style and don’t much care for modern looks so we knew we wanted to go for an Edwardian vibe with our bathroom and WC. 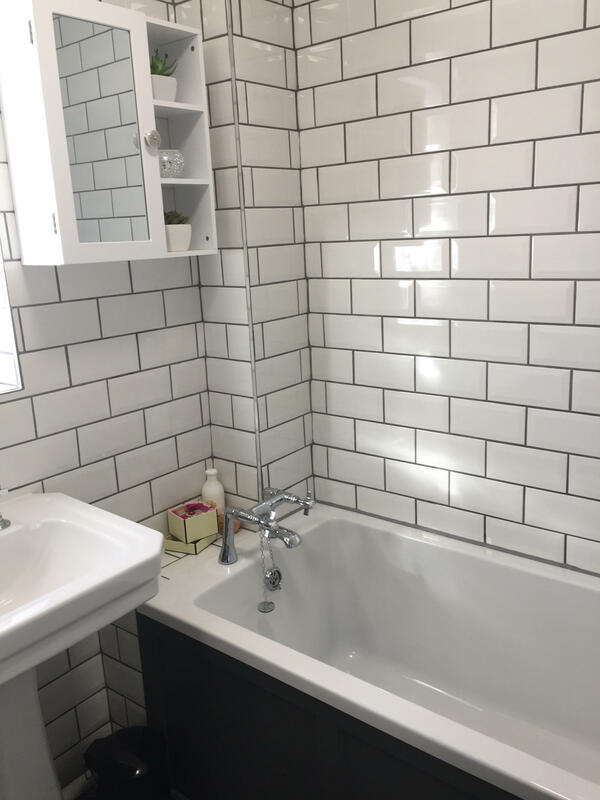 Sadly, we didn’t have the space for a free-standing roll top bath so have combined this plain square shape with the grey bath panel as a space-saving alternative. 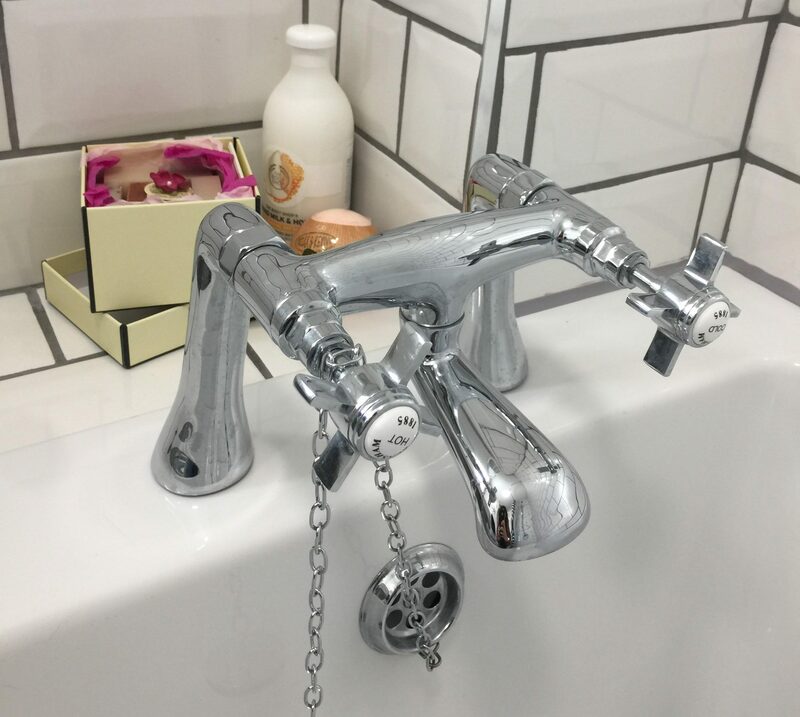 The addition of this tall Bensham mixer tap and chain plug really fit the theme. 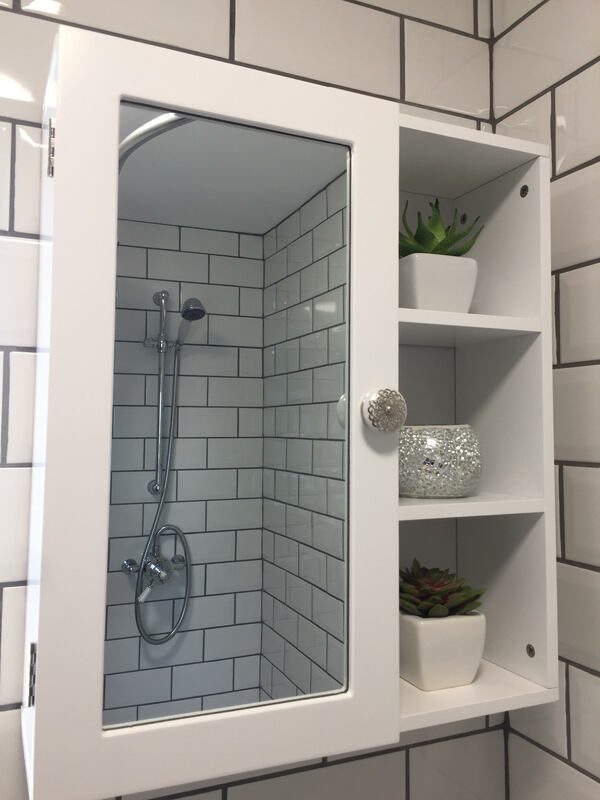 We were also able to make a happy compromise on the shower; everything internal is very modern but by using this white shower head and lever control panel is in keeping with the traditional feel. I wanted a shower curtain and Hubs wanted a screen so we ended up compromising with a half fixed screen and then a curtain – best of both worlds. Due to the positiion of our window fitting a curtain rail would be tricky so we used a rounded version which turns back towards the wall, creating almost a cubical effect (links to all products below). Happily, we did have room for this beautifully shaped Savoy sink pedestal and I just love how it looks. Not having a cabinet surround means we have plenty of room either side for an extra, narrow storage unit which we hope to add soon. 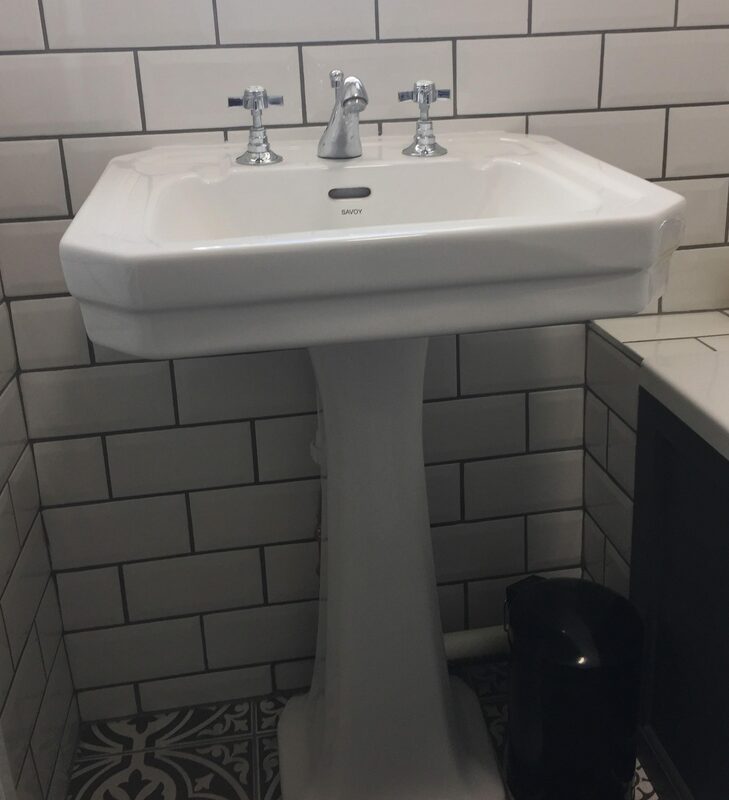 We chose subway style wall tiles to fit the theme but used dark grey grout to make more of a feature of them, so we didn’t have too much white, and frankly to show less dirt and mold! My favourite part of the whole project are these gorgeous floor tiles. Since we have stuck to such a plain and simple colour scheme throughout we wanted something a little different for the floor to break things up. 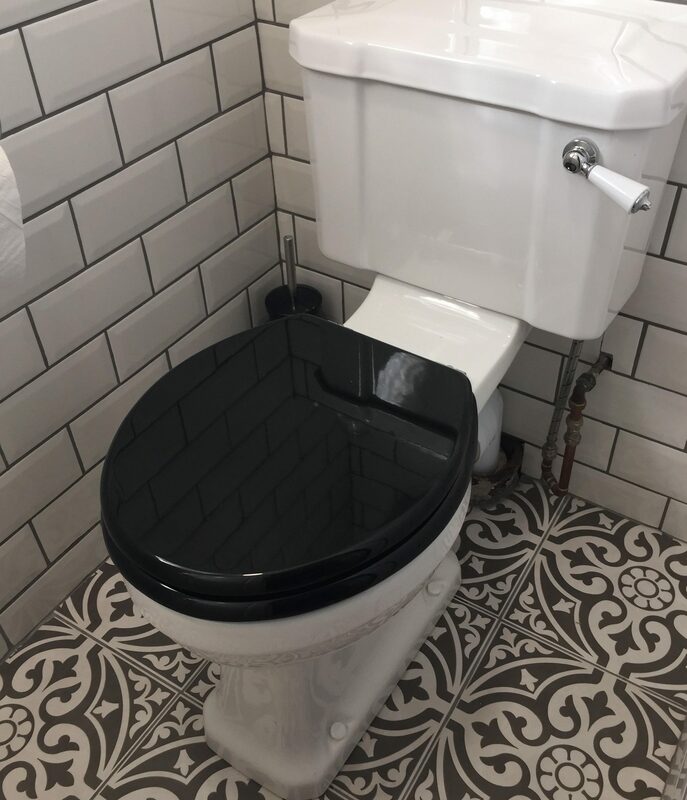 In the separate WC we chose a matching toilet and opted for a black seat as it seemed more in keeping with the style and, again, broke up the white. The part I enjoy most about decorating any room is picking all the accessories and finishing touches. We bought this unusual mirror about a year before we began the project and used it as style inspiration. Both the cabinets were really reasonably-priced; we switched the handles to add some interest and to fit better with the style. 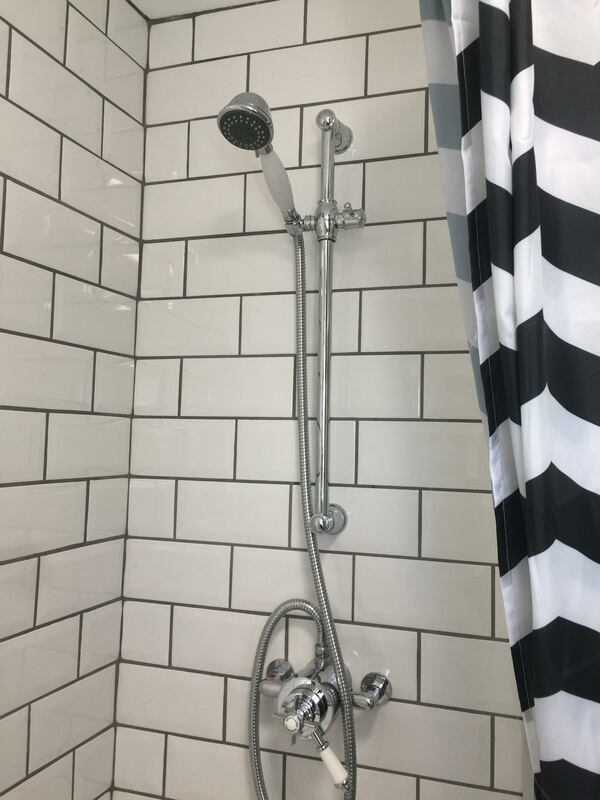 The rest of the accessories – including the bin, toilet brush holder, toilet paper holder, bath mat, soap dispenser and chevron patterned shower curtain came from Wilko and were such great prices. 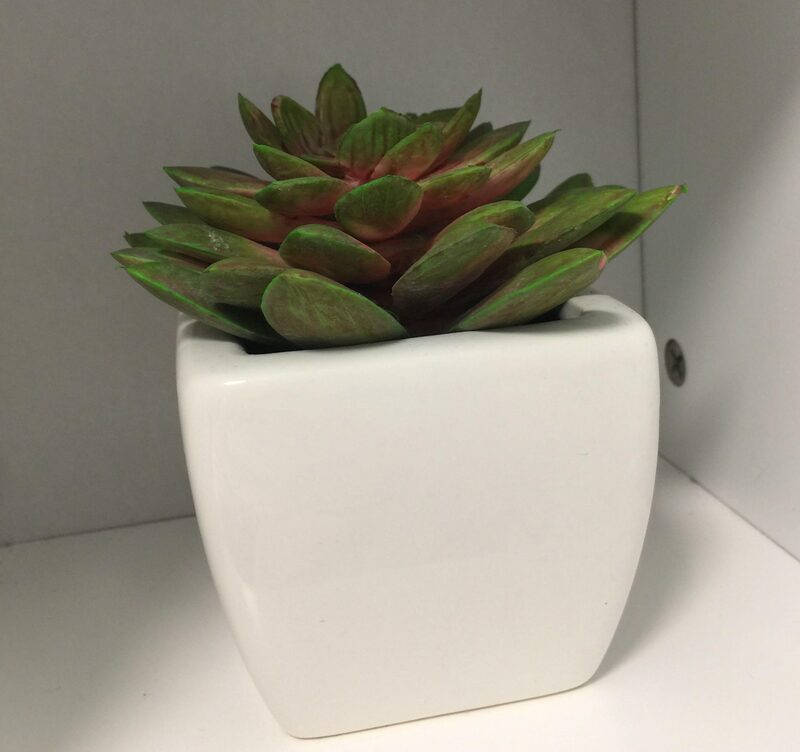 To add a little greenery we also picked up these artificial succulents. We’re incredibly pleased with the overall look and especially love how bright and big the bathroom feels compared to our old, dark and dingy room. A lovely long soak is now even more blissful! Disclosure: Some Wilko items were gifted to us in exchange for an honest review. Words and opinions are all my own. What a fantastic looking bathroom. We had ours done over in January last year and it’s made an amazing difference to the look and feel of the room. I am loving this darling upgrade, especially those tiles. Oh wow this is amazing! 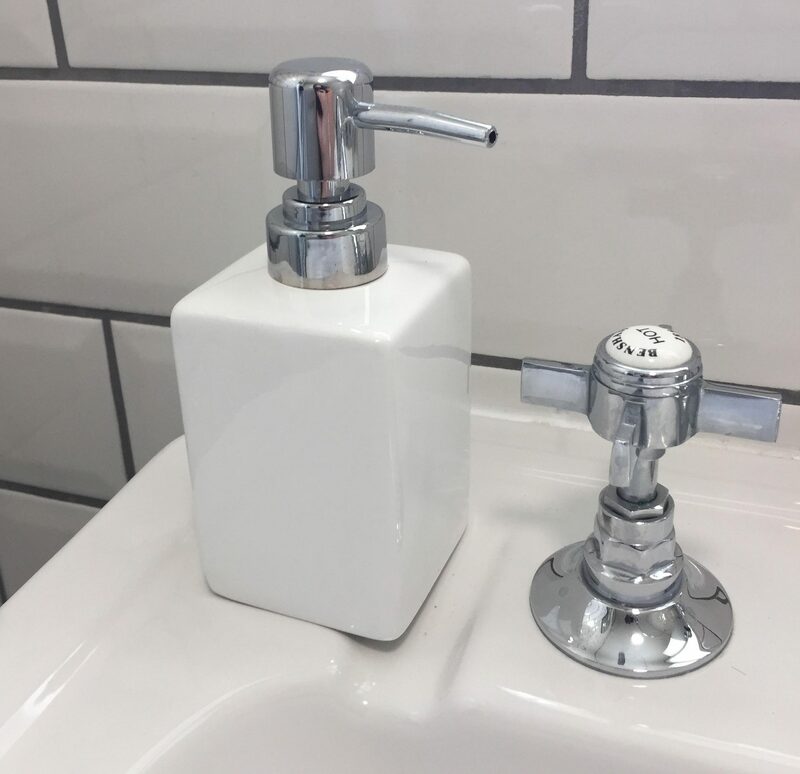 What a gorgeous, unique bathroom you have created! We are in the process of doing ours! 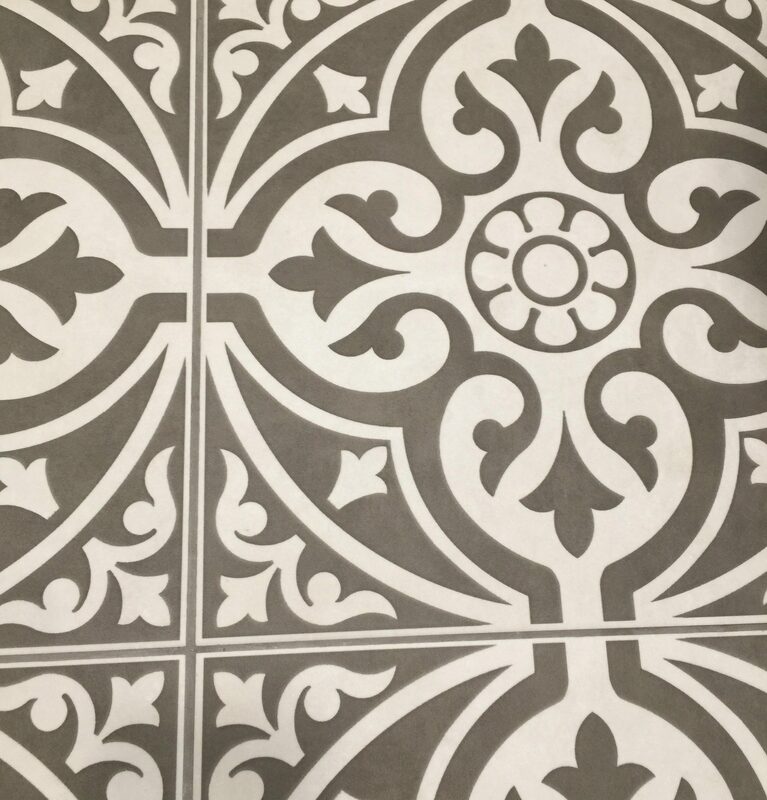 Love your floor tiles! I don’t have a local Wilko but i went into one just before Christmas and saw some great things for the bathroom and kitchen. Your bathroom looks amazing. I love your white tiles, I would love my bathroom to look like this. Love the look of the bathroom. The mirrors look great. What a lovely looking bathroom I especially like the floor tiles ! I love the tiling. The pattern is something really special. Really lifts the room. The less said about our bathroom the better! 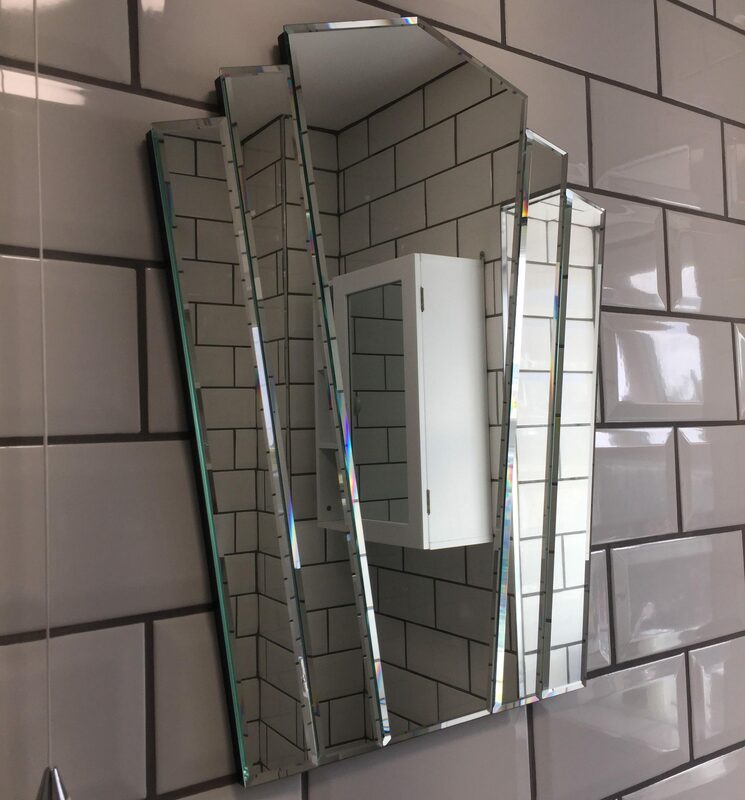 Your bathroom is beautiful – I love the mirror, such an unusual style! Oh wow I am in love with this bathroom. The walls are gorgeous! This is an excellent post. 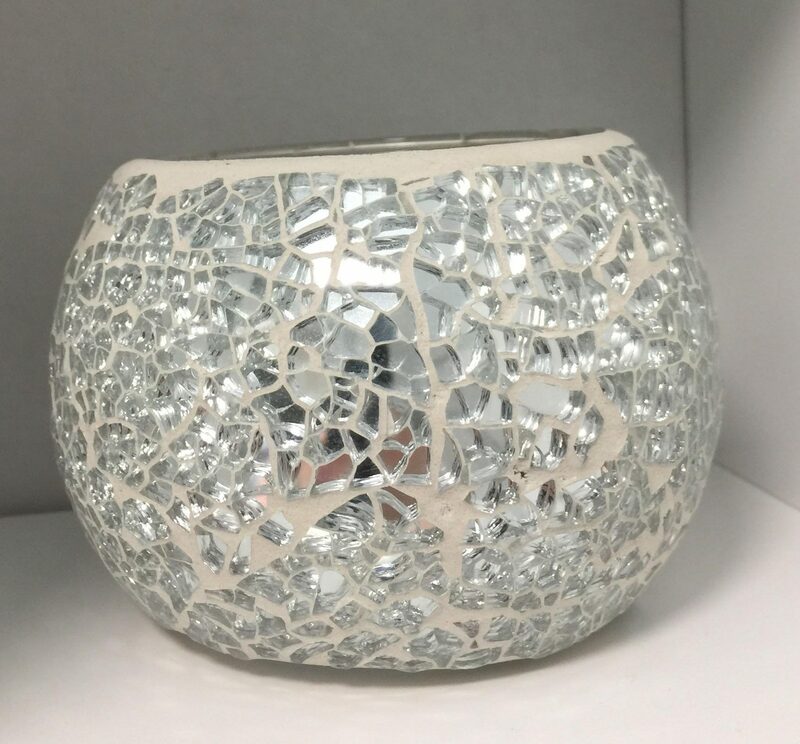 Your bathroom is looking so amazing Your bathroom decoration is great. I think it is a creative idea. It will inspire me very much. Thanks for sharing the excellent post! What a great makeover. I just love the bath taps! Hey Laura, another Laura here Lol… Fabulous!! Every detail is perfection!! The cabinets are so gorgeous and the shower mirror looks like antiques. Beyond words. That’s so good to know. So many things I’ve learnt from your post as I’m facing this kinds of problem. Very lucky to find your post. Thanks a lot for sharing. Vanity units are ideal for any bathroom, as they combine storage and a basin into one space-saving design. 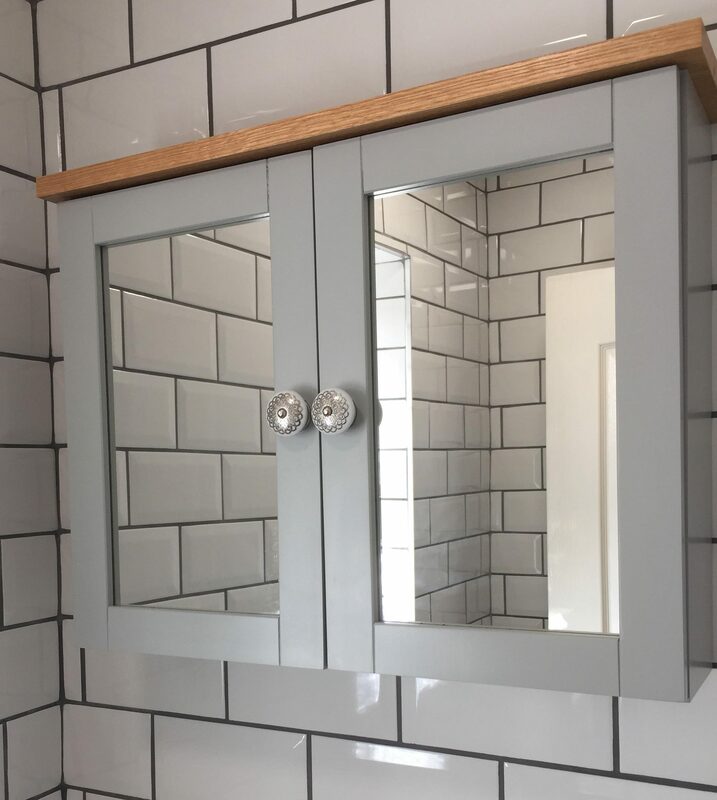 For a coordinated scheme, choose a matching WC unit which conceals the cistern and pipework for a neater finish, and for the finishing touches, an illuminated mirror will help bring the look together.